The Proteco Ace is a 230v electromechanical swing gate motor system with a linear ram configuration. Being the most powerful swing gate opener Proteco offers, it is designed to operate heavier metal gates and is unsuited for wooden gates (common in the UK) . 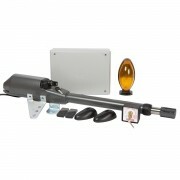 It is suitable for driveway inward opening gates featuring moderately sizes gatepost or pillars (100mm - 300mm). The Ace is engineered to be robust and long-lasting, and is made with quality materials (die-cast aluminium, stainless steel, bronze and steel) and like all Proteco motors comes with a 3-Year warranty as standard. 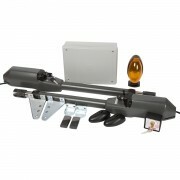 The Proteco Shark is a discrete underground 230v electromechanical swing gate motor system designed to operate either metal or wooden inward opening gates. 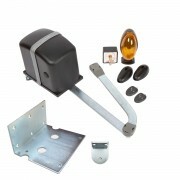 It can also be used to open gates outwards with the addition of 180° angle adaptor accessory. The Shark has IP66 protection but like all underground gate automation will require suitable drainage to ensure that motor does not stand in water. The underground chamber (foundation boxes) are available in powder-coated galvanised steel or stainless steel. The Shark is made to last, engineered to be robust and hard-wearing and this is reflected in the quality of the materials used (die-cast aluminium, stainless steel, bronze and steel) and why we offer a 3-Year motor warranty as standard.